Back to the usual pattern this week with what I think is a pretty easy one. Last week's fishy location is an overpass (as virtually everyone guessed) but no one got the location—the 142nd Street SE bridge and freeway transit stop in Bellevue near the Eastgate Park and Ride. Bus "bays" 3 and 4 have quite a school of these bronze spawning salmon leaping railings and launching over retaining walls. 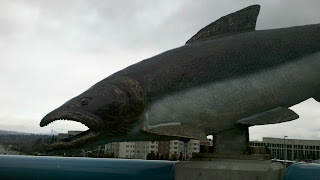 These 32 fish comprise "Return of the Salmon" and are an installation by architect and "art practitioner" Alex Young. They were part of the Sound Transit enhancements to the Eastgate Park and Ride in 2006. Placed so as to "swim" along the concrete walls and rails of the pedestrian area, some can be seen by eastbound drivers near the exit to Bellevue College, but "the salmon sculptures are mounted to give the transit customers the very best view," according to a Sound Transit spokeswoman.